Most of us think we’re not that special. And that only truly amazing people like Gandhi, Nelson Mandela, Mother Theresa and Martin Luther King Jr. are qualified to change the world. You know what? Those things aren’t true. YOU are special and amazing. YOU are alive right now, at this super critical turning point in humanity’s evolution, for a reason. … to make a big difference. … to play an important role in awakening and transforming our planet. … to be your most authentic self. … to literally change the world. Want to find out how to make your “Grand Purpose” happen? 1) You want to earn a solid income AND make a big difference, without burning out. 2) You want to connect with and learn from other heart-centered, socially engaged entrepreneurs. 3) You want to help make big changes in the world (even if you’re not exactly sure how). 4) You want top tools for time management and cultivating an entrepreneurial mindset from one of the world’s leading socially minded business success coaches. 5) You want to discover what has worked for hundreds of socially conscious folks like you to build genuinely lucrative businesses focused on profound service to the world. RSVP Here For The 2014 Visionary Entrepreneur Empowerment Training! Nearly 50,000 people from 60 countries have been through Ryan Eliason’s webinars. Thousands of people have had their worlds rocked – and their work transformed – by Ryan and YOU can be next. 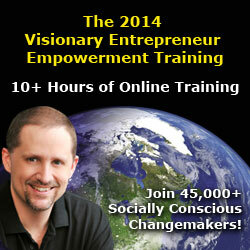 Register For The 2014 Visionary Entrepreneur Empowerment Training.